Visit nearby Ngorongoro Conservation Area, Arusha, Lake Manyara, Serengeti and other National Parks. East Africa's only "International" Marathon. We would like to acknowledge kind support by Global Partners for Development from States and World Runners from Japan for donating $ 3000 and $ 4000 in the year 2001 and 2002 respectively being prize money awarded to winners. They also donated t-shirts. Special thank should go to Mr. Noriuki Kato of World Runners and Mr. & Mrs.Don Harris And Mr. & Mrs. John Michler of Global Partners for Development. Apart from taking keen interest on Development Projects, they have developed very close relationship with the race. We look forward for their continued cooperation and assistance. Let me not forget to acknowledge the support extended to us by AFGEM (T) for donating shs.500,000= plus medals and t-shirts, Leopard Tours Ltd. for donating shs.500,000= in 2001 and shs 300,000= in 2002 and Tanapa for donating shs.1,000,000=. LAND OF KILIMANJARO “THE ROOF TOP OF AFRICA” AND WELCOME TO MOUNT MERU INTERNATIONAL MARATHON ARUSHA - TANZANIA. 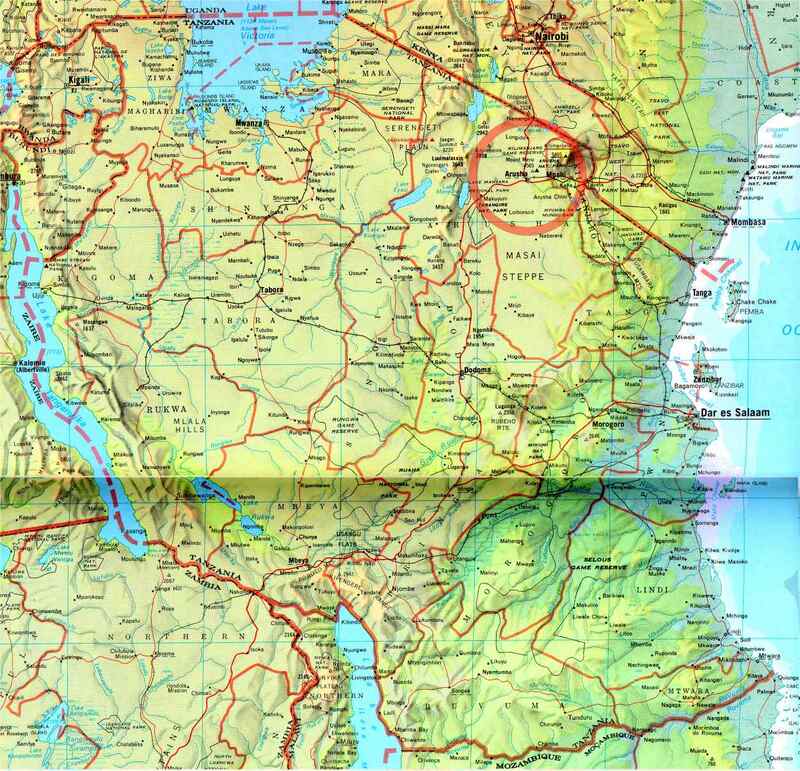 Tanzania is located on the Eastern Coast of Africa and covers a landmass approximately 937,062 sq. kms and lies between 1 and 11 degrees south of the Equator. In addition to sharing borders with eight different countries, it shares the shorelines of some Africa's most spectacular lakes. In the north are the largest lake of Africa and the source of Nile - Lake Victoria. Lake Tanganyika the world's second deepest lake lies in the west. In the Eastern coastline is the Indian Ocean providing Tanzania with hundreds of kilometers of clean beaches and calm bays. A beautiful retreat lies just off the shore in the form of isle of spices as the island of Zanzibar is known, with ancient remains and pleasant atmosphere and still retains the original Arab and Swahili culture. The islands of Pemba and Mafia offer some of the finest deep sea fishing and snorkeling in the world. Tanzania famous for Wilderness and Wildlife splendour has a quarter of the country set aside as National Park and game reserves. Selous, Rungwe, Ruaha, Mikumi are situated both in partly Eastern and Southern part of Tanzania while Mahale Mountains; Gombe stream, Rubondo and Katavi are in the Western part of Tanzania. In the Northern part of Tanzania there is the World famous Serengeti National Park, Ngorongoro Crater, Lake Manyara, Tarangire and the snow caped Mount Kilimanjaro. South West of Kilimanjaro lies Mount Meru the base of Mount Meru International Marathon - Arusha. In addition to the exhilarating experience of climbing to the "Roof top of Africa " Mt. Kilimanjaro - visitors may also attempt the summit of Mt. Meru (4,566 meters) in the shadow of Kilimanjaro. You are all most welcome to Tanzania and to Mt. Meru International Marathon in Arusha. One can reach Arusha by flying either to Kilimanjaro (Arusha), Dar-es-salaam (Dar-es-salaam) or Nairobi (Kenya) international airports. After the race have a game tour at one of our famous National Parks. 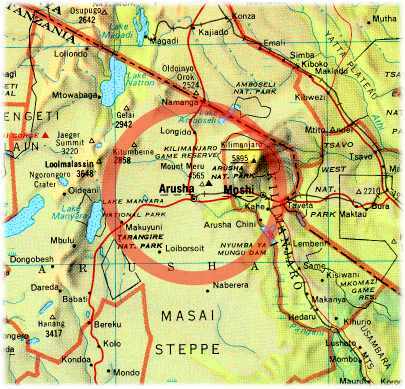 The city of Arusha lies between Mt. Kilimanjaro and the great Serengeti plain in northern Tanzania, the heart of wildlife safari country, writes Al Boka. For 16 years Arusha has also been host to a "running safari", the Mount Meru International Marathon, which is attracting a growing tourist-runner following. The Ngorongoro Conservation Area and the national parks of Arusha, Lake Manyara, Serengeti and Mt. Kilimanjaro are just a short distance away. There are more animals-in-the-wild to see than just about anywhere else on earth; lions, leopards, elephant, giraffe, rhinos, hippos, gazelle, buffalo, baboon, etc. This region of East Africa is the cradle of mankind as well as a haven for wildlife. Nearby, in the Great Rift Valley's Serengeti Plain, lies the Olduvai Gorge. Here the oldest known primate fossils considered to be members of the true human genus; Homo habilis (handy man), were found. We are all considered descendents of, and have a common ancestor in, this "Olduvai Man" who lived approximately 1.75 million years ago. Interesting inhabitants of the region are the Maasai tribe. The Maasai are traditional nomadic herders and warriors who are being increasingly drawn towards the urban tourist economy that is present day Tanzania. However, their way of life is still Spartan and elemental. While world travellers bounce along rugged roads in their four-wheel drive vehicles the Maasai pass along serenely, on foot, through the rough scrub. 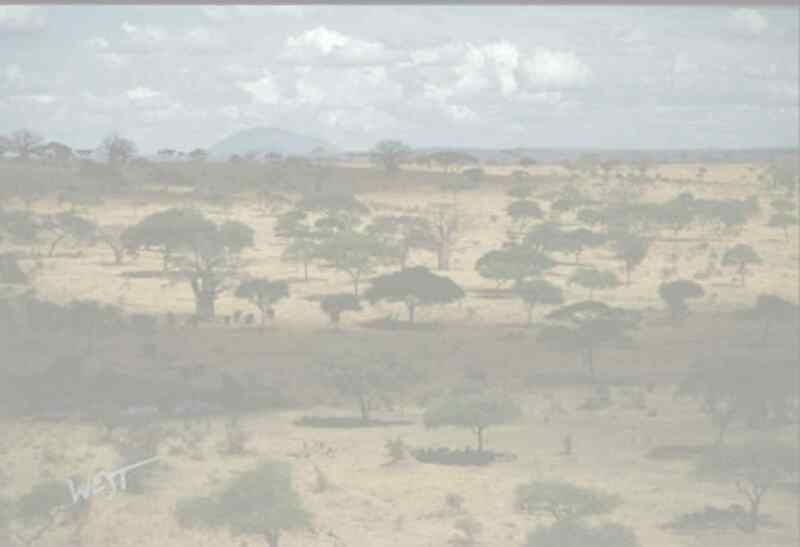 Covering great distances on foot is part of everyday Maasai existence. The starting line of the Mt. Meru Marathon also allows a glimpse into a different life then most runners are accustomed to seeing. Tanzanian national coach Suleiman Nyambui (500m silver medalist at the 1980 Moscow Olympics) resplendent in national team colours, tends to his charges. Many have won or placed in marathons overseas while others aspire to do so. Their running outfits are worn and whether owned or loaned are partly national issue, partly sponsor-distributed. The rest is improvised: halfway into the race I noticed a man running in a cashmere blouse. Many top Tanzanian runners train at altitude in nearby Moshi and the Mount Meru Marathon is the only national event in which they can test their skills. The look and feel of the front line would be the envy of many race directors elsewhere. The race begins in the town centre, in front of the clock tower, and heads west. Hugh Jones takes up the story: When the starting flag is dropped, I’m left standing. After four hundred metres the only people behind me are the runner-tourists. Nearly all the Tanzanians are ahead by a clear margin, including all of the six competing Tanzanian women. It’s no wonder. There is no such thing as ‘fitness running’ in Tanzania. You run to win, and winning may open up further possibilities for competition abroad – from which riches could flow. It’s all there to run for. Out on the road these calculations may appear overly ambitious and other-worldly. Life goes on as normal all around us. We run out on the main Dodoma Road (towards the official national capital many km distant) past early Sunday-morning life. We keep near to the centre of the road to avoid the activity spilling off from the pavement: makeshift roadside stands, people on bikes transporting impossible loads and minibuses cruising for customers. We take a turn to the north and head out on the Nairobi Road. I catch some of the slower Tanzanian runners, including a couple of the women. From early on, laughter from the roadside was part of the experience. At first it seemed that the cause of mirth was the sight of a red-faced European puffing along in the wake of the locals. As I caught the leading woman at 10km, another round of laughter erupted in our wake. She was wearing running briefs and revealing much more upper leg than onlookers were used to seeing. Peals of laughter erupted as we passed and I reflected that she deserves every cent of whatever prize money she wins. After 10km the course cuts through farmland on a very roughly surfaced road, before rejoining the Dodoma Road at Arusha Airport. With the wind at our backs we raced out, further west, to the turning point. I counted about fifty runners heading back towards Arusha before I made that turn myself. With the wind now against us, many suffered. I passed two dozen runners, some of them jogging and some walking. The survivors clustered into groups, and the wide gaps between them made for lonely running. Coming back into town the roadside activity was in full flow, as buses revved, cyclists meandered along the edge of the road, and crowds gathered in a sociable Sunday morning mood. We passed back over the start line with still a mile to go and finally ran onto the dirt track inside the city stadium. Crowds packed the stands along the home straight and spilled over onto the infield. This was the big event of the weekend and the whole town, it seemed, turned out to enjoy the spectacle. Al Boka adds: A total prize money package of US$3,000 was offered to the top 6 men and 4 women. The men's winner was John Nada Saya in 2:17:04 ($1,000) with second place going to Benedict Ako in 2:18:05 ($500). Both are from Arusha. Banuela Mrashani won the women's race in 2:47:21 ($500) while Blanka James came in second in 2:58:03 ($250). Association of International Marathons & Roadraces (AIMS) Secretary Hugh Jones was the first non-Tanzanian finisher in 2:38 for 24th place overall. Starting just before the marathon, there were 5km runs for approximately 150 boys and girls, including some from neighbouring African nations. While the children's enthusiasm was unparalleled there was a noticeable lack of "proper" running equipment. This year's children's run was hosted by AIMS. The ASICS Corporation and Citizen Watch Company provided many prizes for the competitors which were presented by Arusha Mayor Philip Kivuyo, AIMS President Hiroaki Chosa and ASICS Senior Managing Director Masaaki Uetsuki. There could be future Olympic champions in there somewhere. A special meeting of the AIMS Board of Directors was held in conjunction with the race. It was the first time the board has met in Africa. The hosts in Arusha were most gracious and accommodated all of our requirements. The AIMS meeting preceded, by two weeks, the arrival of President Clinton for the Burundi Peace Meeting. AIMS was established in May 1982 with its first World Congress in London. For two years, before that, informal meetings had been held in New York, Honolulu and other venues by some of the world's leading marathon race directors including Will Cloney (Boston), Fred Lebow (New York) and Chris Brasher (London) with a view to setting up such an organisation. · to exchange information, knowledge and expertise among the members of the Association. From those beginnings 18 years ago, AIMS has made remarkable progress. At the 5th World Congress of AIMS held in 1989 in Melbourne, membership was extended beyond marathons to include all road races. AIMS has become the major force behind the development and progress of road running throughout the world. From 28 members in 1982 it has grown to over 150 members in more than 50 countries, including nearly all the world's premier marathons and many major road races at other distances. AIMS has set firm standards of course measurement. The IAAF has recognised and adopted the AIMS system as its standard. All AIMS members are required to have their courses so measured. AIMS continues to co-operate with the IAAF in holding course measurement seminars in various parts of the world, and in questions relating to doping control. The IAAF contributes to the publication of a joint magazine with AIMS, Distance Running, which is distributed worldwide to 450,000 runners participating in AIMS member events. AIMS recognises world fastest times on the road is working with the IAAF on acceptable criteria for joint recognition of world road records. Arusha may be reached by flying into Kilimanjaro, Nairobi or Dar es Salaam international airports and continuing on via ground transportation. The deluxe, air-conditioned bus connection from Dar es Salaam to Arusha proved to be a 9-hour voyage of adventure. Gazing out of the window at the passing sights, including the majestic snow-capped peak of Mount Kilimanjaro glinting in the late afternoon sun, is much like an viewing an uninterrupted sequence of National Geographic Explorer. 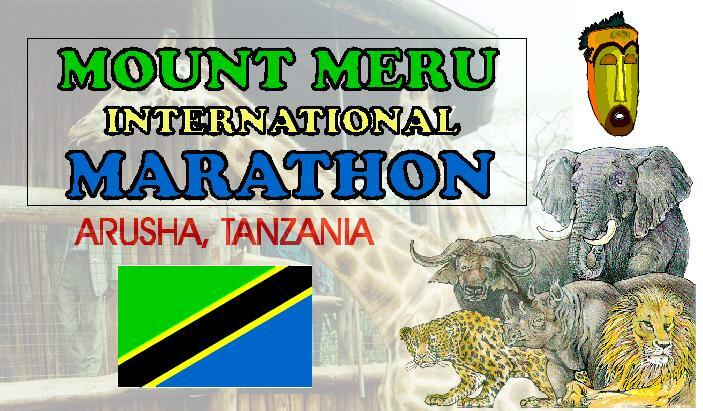 The Mount Meru International Marathon is a long-time AIMS member and well worth a visit. Accommodation ranges from $20 to $160, to suit all needs. Many safari companies operate in Arusha and will help you to plan and execute your adventure trip. If you use Dar es Salaam as an entry point take a few extra days for a side-trip to the nearby "Spice Island" of Zanzibar. Be sure to bring your camera, a zoom lens and lots of film.